Bring an end to time-consuming searches for your vacation photos, favorite movies, or desired songs. Nero MediaHome Unlimited brings order to your digital life. Be it music, photos, videos, movies, TV series, audio CDs, or DVD-Videos™, and whether on your PC or mobile device: Nero MediaHome is the universal media center for archiving, organizing, creating, and playing your files. 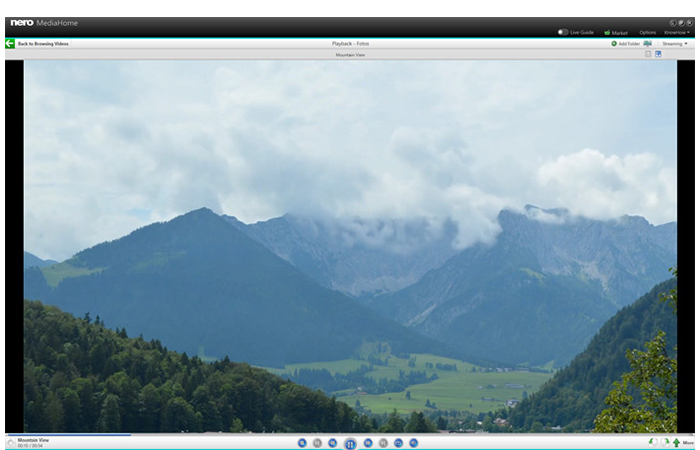 Put the spotlight on your favorite pictures with Nero MediaHome 2019 Unlimited. Compose a slideshow of your favorite pictures. 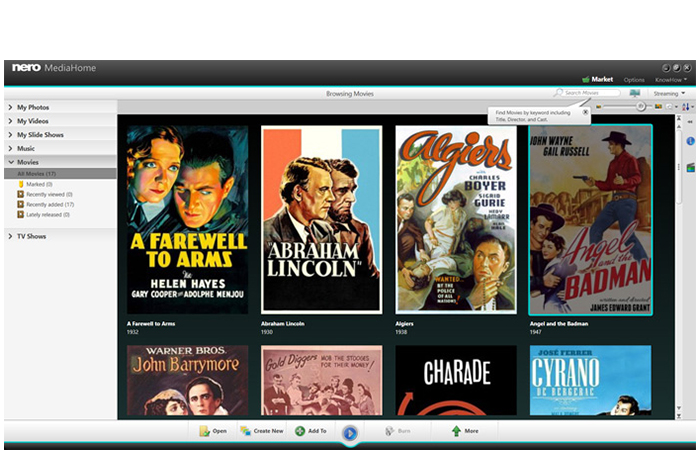 Thanks to the automatically added cover & title, you can quickly and easily find a wide variety of movies and TV series. With Nero MediaHome 2019 Unlimited, you now have access to your "OneDrive - Files On Demand" and can play them back. 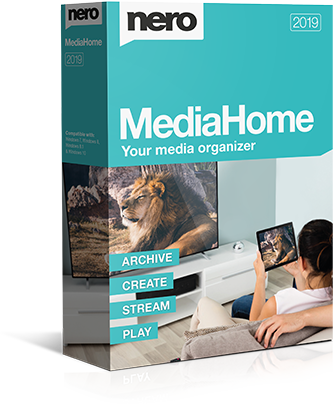 Stop searching, start finding: Give your multimedia files a home. 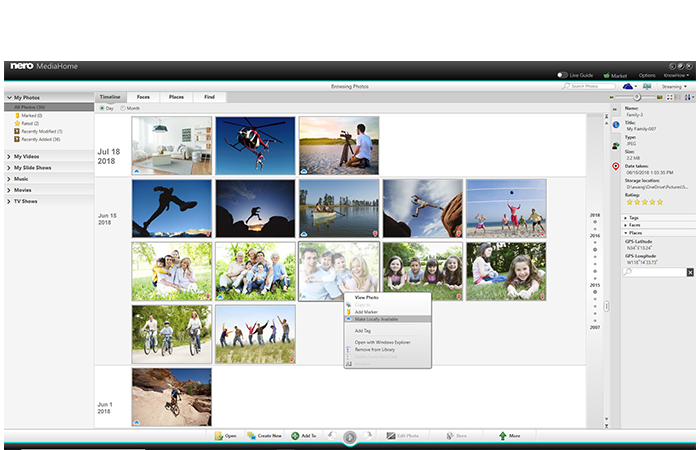 Send photos and movies to your PC wirelessly from your iOS or Android mobile device, and via USB from external hard drives or memory sticks. Import music files or rip music from audio CDs - which, thanks to Gracenote® technology, even include original album covers. With items archived in clearly arranged categories and sorted by date, faces, places, favorites, or personal tags, you can now find all your media even more quickly. 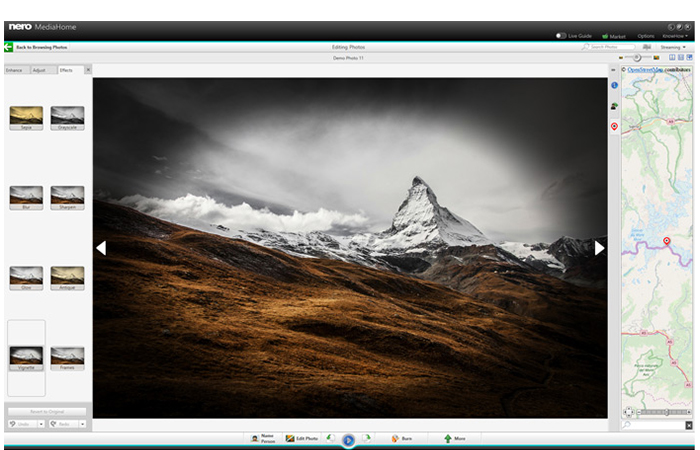 In addition, you can also connect directly to Windows Media® Player and iTunes® media libraries. You can also access your OneDrive Online files (Files On Demand) and download them directly, as and when you please. This saves you a lot of storage space on your PC. Make something good even better: Want all your media in one place? Then it’s a good time to quickly make things even better than they were before! With its usual fantastic quality, Nero MediaHome Unlimited is there to help you through the process! Refine photos with automated tools and a variety of effects, create slide shows from photos and videos, and enhance them with music, movie design templates, and credits. Create music playlists or entire albums that include photos or videos. Burn video clips and slide shows in DVD-Video™ or Blu-ray Disc™ formats - complete with menus - for playing back on DVD or Blu-ray Disc™ players. And thanks to integrated Gracenote® technology, you can even burn audio CDs and MP3 discs, including the original album covers. Start enjoying your media wirelessly: You can count on the full streaming power of Nero to give you complete access to your photos, slide shows, music, videos, movies, and TV series, wherever you are! Use the Nero Streaming Player App for your iOS and Android device as a remote control for your PC-based media library, letting you easily play everything wirelessly on your living room TV. XBOX®, PlayStation®, and other home network devices are also supported. And the best thing about it? You can access your entire media archive, as sorted by you. At long last, you can quickly and easily find whatever it is you want to look for. 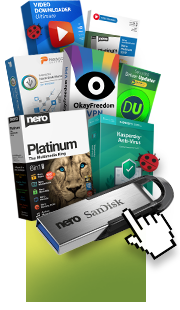 Immerse yourself in a nonstop range of media: DVD-Videos™, movie files, music, photos and slide shows, movies, and TV shows: Nero MediaHome plays any file in almost any format with the best output quality. Also, use the integrated Gracenote® technology to display the appropriate album cover for your songs on every device. The free Nero MediaHome WiFi Sync App ensures that you can exchange and play files wirelessly between iOS and Android devices and your media center. This means you can always access your favorite files – both at home and on the go!